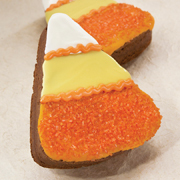 This colorful confection is the brownie replica of the popular Halloween treat...candy corn! Our version is a brownie dipped in white and orange chocolate, then sprinkled with orange sanding sugar. Each candy corn is wrapped in a cellophane bag and tied with a ribbon. Ingredients: Ingredients: Dark brown sugar, unsalted butter, fine chocolate (unsweetened and semisweet), eggs, enriched bleached flour, vanilla, kosher salt, baking powder, fine white chocolate, orange tinted chocolate, orange sanding sugar, orange candy writers (sugar, palm kernel oil, cocoa, non-fat dry milk, dry whole milk, glycerol lacto eaters of fatty acid, salt, artificial coloring), yellow food coloring.